Born in Kochi. From age 17 studied with Koyama Shotaro at Fudosha. Participated in formation of Taiheiyogakai in 1902. Traveled to Europe and U.S. in early 1900s. Exhibited paintings at Bunten, Teiten, and the Panama-Pacific Exposition in San Francisco in 1915. 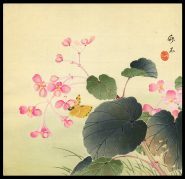 In 1943 became head of the school of Taiheiyogakai; withdrew in 1947 to become founding member of Shigenkai, a society to exhibit Western-style painting. In 1950 became an adviser to Nitten. Prints include Inland Sea landscapes in the 1930s and a set of 10 nudes in 1934. ** Taken in whole, or in part, with permission from: Merritt, Helen and Nanako Yamada. Guide to Modern Japanese Woodblock Prints: 1900-1975. University of Hawaii Press: Honolulu. 1992.